What could more fun than taking Cage Cricket to the North Wales coast on a sunny Bank Holiday? If this wasn’t enough Glamorgan CCC were playing Sussex CCC on the adjacent Colwyn Bay CC ground and Neil Bunting even got to meet Jack Russell. Not surprisingly, the match attracted a large crowd and during the day several groups took a break from watching the professionals to have a go at Cage Cricket themselves. The girls from Colwyn Bay Mixed Ability CC, who provided a Guard of Honour at the start of the match were frequent visitors to the Cage and showed great skills. As did a couple of couple of boys from the NE Wales representative team along with other young people visiting from Mold. 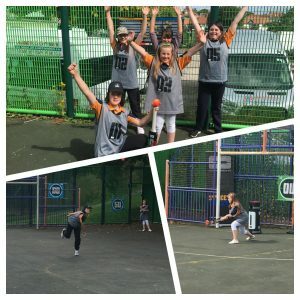 The latter group impressed Neil Roberts from Colwyn Bay CC so much that they were invited to future sessions at the club, illustrating how Cage Cricket can prove a launchpad into the parent game. Thanks very much to Neil for arranging the session and to Rob Ward from Cricket Wales who really liked what he saw and is very keen to push for more Cage Cricket opportunities in the area.